Remove the intake manifold cover. Refer toIntake Manifold Cover Replacement. Caution:Do not remove the pigtail from either the heated oxygensensor (HO2S) or the oxygen sensor (O2S). Removing the pigtail orthe connector will affect sensor operation. Handle the oxygen sensor carefully. Do not drop the HO2S.Keep the in-line electrical connector and the louvered end free ofgrease, dirt, or other contaminants. Do not use cleaning solventsof any type. Do not repair the wiring, connector or terminals. Replace theoxygen sensor if the pigtail wiring, connector, or terminal isdamaged. This external clean air reference is obtained by way of theoxygen sensor signal and heater wires. Any attempt to repair thewires, connectors, or terminals could result in the obstruction ofthe air reference and degraded sensor performance. Do not apply contact cleaner or other materials to the sensoror vehicle harness connectors. These materials may get into thesensor causing poor performance.Do not damage the sensor pigtail and harness wires in such away that the wires inside are exposed. This could provide a pathfor foreign materials to enter the sensor and cause performanceproblems.Ensure the sensor or vehicle lead wires are not bent sharplyor kinked. Sharp bends or kinks could block the reference air paththrough the lead wire.Do not remove or defeat the oxygen sensor ground wire, whereapplicable. Vehicles that utilize the ground wired sensor may relyon this ground as the only ground contact to the sensor. Removal ofthe ground wire will cause poor engine performance.Ensure that the peripheral seal remains intact on the vehicleharness connector in order to prevent damage due to waterintrusion. 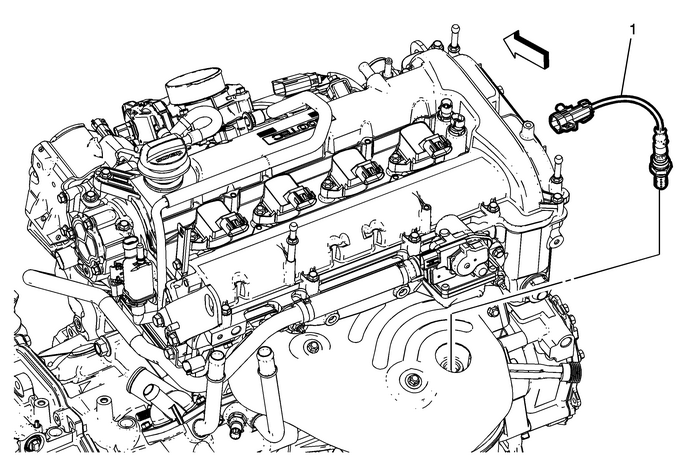 The engine harness may be repaired using Packard's Crimpand Splice Seals Terminal Repair Kit. Under no circumstances shouldrepairs be soldered since this could result in the air referencebeing obstructed. ProcedureDisconnect the heated oxygen sensor harness connector.If reinstalling the old sensor, coat the threads withanti-sieze compound. Refer toAdhesives, Fluids, Lubricants, and Sealers. Tip:A special anti-seize compound is used in the HO2S threads.The compound consists of liquid graphic and glass beads. Thegraphic tends to burn away, but the glass beads remain, making thesensor easier to remove. New, or service replacement sensorsalready have the compound applied to the threads. If the sensor isremoved from an exhaust component and if for any reason the sensoris to be reinstalled, the threads must have anti-sieze compoundapplied before reinstallation.